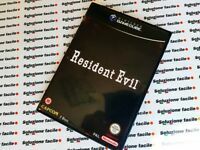 NINTENDO GAME CUBE PAL) NGC RESIDENT EVIL PRIMA STAMPA OTTIMO COMPLETO !!! RARO! Dettagli su Need for Speed Underground 2 PAL Nintendo GameCube GC EA Games Original NEW! Need for Speed Underground 2 PAL Nintendo GameCube GC EA Games Original NEW!